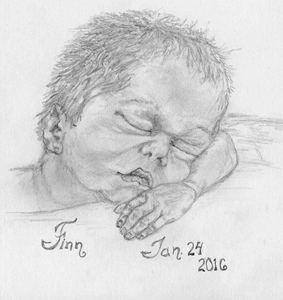 Finn Liam Ponzer, infant son of Phillip and Charissa Ponzer, came to us and was called home to be with the Lord on January 24, 2016. Finn is survived by his parents, his brother, Jaxton, grandparents Penny and Robert Ponzer, and Len and Cheryl Mathis, aunts and uncles Mandy Ponzer, Corey and Alecia Simpson, and Bryan and Brittany Mercer, and great-grandparents.
" And the peace of God, which surpasses all understanding, will guard your heart and your minds in Christ Jesus." Add your memories to the guest book of Finn Liam Ponzer. To our beloved grandson, Finn Liam . You will never be forgotten , and you will be missed dearly by all of your family. You were taken from your family too soon , but God needed another angel in Heaven.